Matthew Apgar - mapgar@shawmedia.com Carol Swinford (left) leads Hawk, a 10-year-old American Miniature Stallion Swinford's Shades of Blue Ranch in Hebron intoFred Stidham's room for a visit at McHenry County Valley Hi Nursing Home on Thursday, March 8, 2018 in Woodstock. 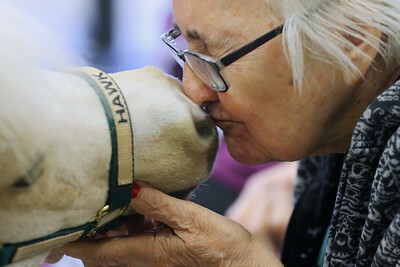 Matthew Apgar - mapgar@shawmedia.com Maria Zupec leans in to kiss Hawk, a 10-year-old American Miniature Stallion, during a visit at McHenry County Valley Hi Nursing Home on Thursday, March 8, 2018 in Woodstock. Hawk is a therapy horse owned by Carol and Gary Swinford from Shades of Blue Ranch in Hebron and was visiting with residents to brighten their day. 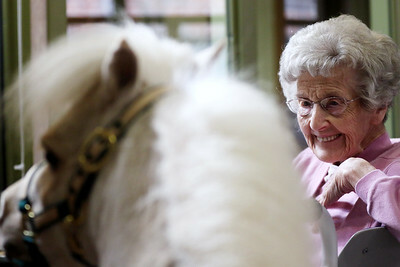 Matthew Apgar - mapgar@shawmedia.com Carol Swinford of Shads of Blue Ranch in Hebron (top left) brings her 10-year-old American Miniature Stallion, Hawk, over to Betty Thiede for a visit at McHenry County Valley Hi Nursing Home on Thursday, March 8, 2018 in Woodstock. Hawk is a 10-year-old American Miniature Stallion from Shades of Blue Ranch in Hebron. 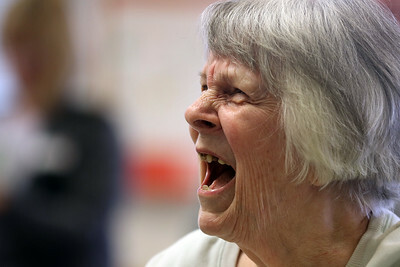 Matthew Apgar - mapgar@shawmedia.com Hazel Postman lights up with a smile upon seeing Hawk, a 10-year-old American Miniature Stallion, during a visit at McHenry County Valley Hi Nursing Home on Thursday, March 8, 2018 in Woodstock. 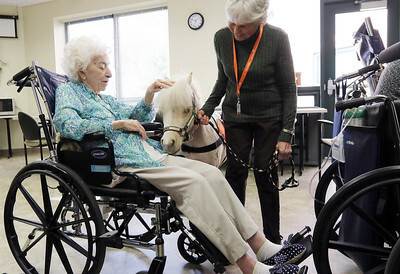 Carol Swinford and husband Gary own Shades of Blue Ranch in Hebron which has multiple miniature therapy horses that they use to brighten up peoples' days. 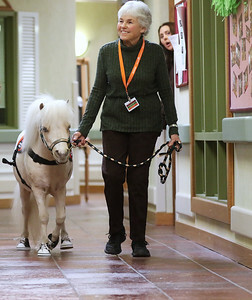 Matthew Apgar - mapgar@shawmedia.com Carol Swinford of Shades of Blue Ranch in Hebron leads Hawk, a 10-year-old American Miniature Stallion, through the hallways during a visit at McHenry County Valley Hi Nursing Home on Thursday, March 8, 2018 in Woodstock. 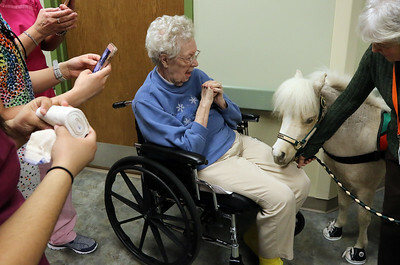 Matthew Apgar - mapgar@shawmedia.com Nurses use their phones to take pictures as Evelyn Farver gets a visit from Hawk, a 10-year-old American Miniature Stallion, at McHenry County Valley Hi Nursing Home on Thursday, March 8, 2018 in Woodstock. Hawk is one of multiple miniature therapy horses owned by Gary and Carol Swinford (right) from Shades of Blue Ranch in Hebron. 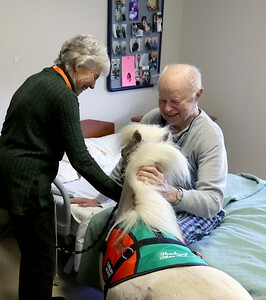 Matthew Apgar - mapgar@shawmedia.com Carol Swinford leads Hawk, a 10-year-old American Miniature Stallion therapy horse, over to Bob and Vilma Peterson during a visit at McHenry County Valley Hi Nursing Home on Thursday, March 8, 2018 in Woodstock. 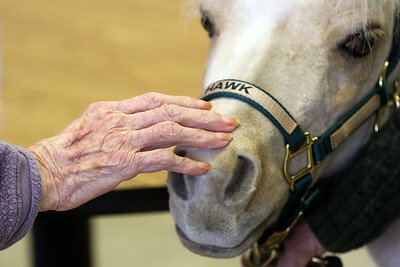 Matthew Apgar - mapgar@shawmedia.com Betty Thiede reaches out to pet the snout of Hawk, a 10-year-old American Miniature Stallion therapy horse, during a visit with residents at McHenry County Valley Hi Nursing Home on Thursday, March 8, 2018 in Woodstock. 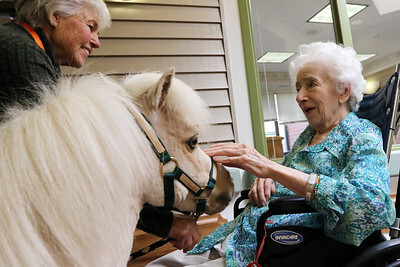 Matthew Apgar - mapgar@shawmedia.com Carol Swinford (left) leads Hawk, her 10-year-old American Miniature Stallion therapy horse, over to resident Virginia Poidomani during a visit at McHenry County Valley Hi Nursing Home on Thursday, March 8, 2018 in Woodstock. 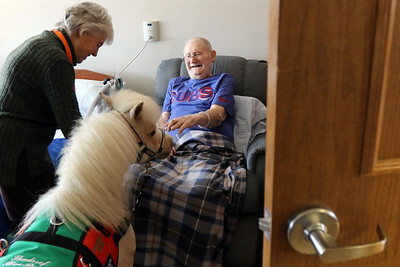 Matthew Apgar - mapgar@shawmedia.com Carol Swinford (left) leads Hawk, her 10-year-old American Miniature Stallion therapy horse, over to resident Tony Alivezos during a visit at McHenry County Valley Hi Nursing Home on Thursday, March 8, 2018 in Woodstock. 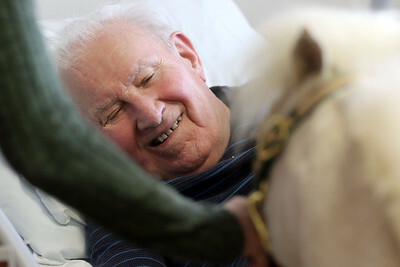 Matthew Apgar - mapgar@shawmedia.com Ed Steffen lights up with a huge smile upon seeing Hawk, a 10-year-old American Miniature Stallion therapy horse from Shades of Blue Ranch in Hebron, during a visit with residents at McHenry County Valley Hi Nursing Home on Thursday, March 8, 2018 in Woodstock. 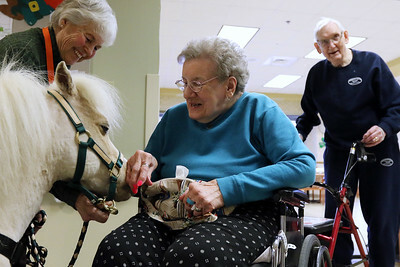 Matthew Apgar - mapgar@shawmedia.com Carol Swinford (right) leads Hawk, her 10-year-old American Miniature Stallion therapy horse, over to resident Virginia Poidomani during a visit at McHenry County Valley Hi Nursing Home on Thursday, March 8, 2018 in Woodstock. 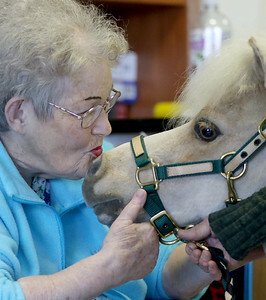 Matthew Apgar - mapgar@shawmedia.com Pat May leans in to kiss Hawk, a 10-year-old American Miniature Stallion, during a visit at McHenry County Valley Hi Nursing Home on Thursday, March 8, 2018 in Woodstock. Carol and Gary Swinford of Shades of Blue Ranch in Hebron brought the therapy horse to residents for a visit. 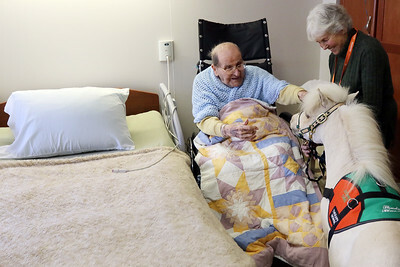 Matthew Apgar - mapgar@shawmedia.com Carol Swinford (left) leads Hawk, a 10-year-old American Miniature Stallion, into Ron Jackson's room for a visit at McHenry County Valley Hi Nursing Home on Thursday, March 8, 2018 in Woodstock. Carol and Gary Swinford of Shades of Blue Ranch in Hebron brought the therapy horse to residents for a visit. 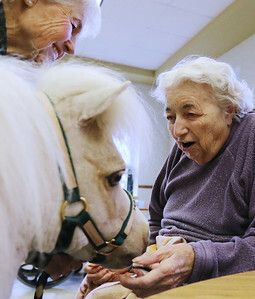 Carol Swinford of Shads of Blue Ranch in Hebron (top left) brings her 10-year-old American Miniature Stallion, Hawk, over to Betty Thiede for a visit at McHenry County Valley Hi Nursing Home on Thursday, March 8, 2018 in Woodstock. Hawk is a 10-year-old American Miniature Stallion from Shades of Blue Ranch in Hebron.